Not everyone has the luxury of a computer and internet access at home, and we're not all experts at using them. 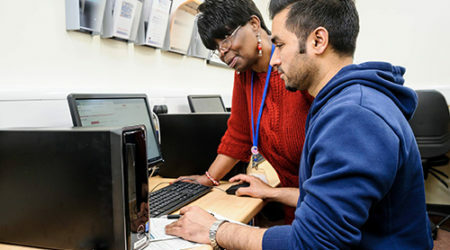 Here at Brunswick Hub we have invested in good computer systems so that we can offer people the opportunity to improve their computer skills and use up to date equipment free of charge. From the beginner who wants to conquer a fear of the computer, to the IT whizz who just needs access to WIFI, we're here to help. Learn My Way is an online course that teaches both the basics of computers and the internet in a relaxed atmosphere. Here at the Hub we offer a IT Drop In service FREE to anyone who wants to use a computer or access the internet.